The original all-tube 5E3 circuit is renowned for its early-onset distortion and highly interactive controls—a little experimentation unlocks a world of tonal treats for your ears. The classic design is updated with improved volume pot tapers, offering more precise control at low settings used for rich, mellow clean tone from the Instrument and Mic channels. The handwired circuit includes premium yellow coupling capacitors chosen for their authentic vintage Fender tone—producing sparkly cleans and creamy overdrive with smooth top end and round mids. 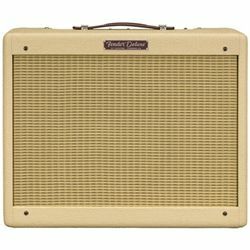 A single 12” 8-ohm Celestion® Alnico Cream speaker delivers these rocking vintage tones, driven by a pair of 6V6 power tubes for 12 watts of classic tube sound and a 5Y3 rectifier tube for authentic tweed touch-sensitive response. Aesthetic appointments include a blonde textured vinyl covering, wheat grille cloth and a top-mounted control panel with easy access to the highly responsive chickenhead control knobs—all housed in a durable cabinet. With timeless looks and premium vintage sound, the ’57 Custom Deluxe delivers everything a guitarist’s heart could desire. Includes a protective cover.